The British government has acknowledged the potential harms of fracking for unconventional gas – yet claimed that regulation in Britain is more stringent than in other countries and that it is therefore possible to prevent negative impacts. In this article I will show that over a century of health and safety regulation in the UK gives no ground for confidence. On the contrary there has repeatedly been shameful disregard for public health and environment. Industrial and commercial interests have repeatedly overridden the right of the public to be protected and there is already evidence that we are seeing the same tragedy replayed – potentially on a more destructive scale than ever before. The truth is that in some cases British regulation is inferior to other countries – that is why the British government are fighting the European Commission to prevent European regulation of shale gas extraction. In the light of all the evidence the only safe way of managing this issue is to ban fracking altogether as has happened in a number of other countries. A good place to start is a 200 page peer reviewed study by 20 authors and an editorial team of 5 people published by European Environment Agency in 2001. The study is titled “Late Lessons from early warning – the precautionary principle 1896 – 2000” (hereafter called the PP study ). This study draws on European and US experience to look at what lessons can be drawn from catastrophes like acid rain; BSE, asbestos, benzene, halocarbons and the ozone layer, hormones as growth promoters and so on. In each case there were early warnings of threats to the environment and public health – but in each case there was a long delay before an adequate response was taken. Why? The histories of a great deal of suffering and destruction that continued longer than they should have done give us warnings about what may happen in regard to fracking. Here is an example – asbestos. As early as 1898 there were strong grounds for suspecting that white asbestos was a serious hazard – and some UK Factory Inspectors said so. It was not until 100 years later, in 1998 that it was banned in the UK. Not exactly a triumph for British health and safety regulation. Why the repeated history of delay? Lessons written up in the PP study bear ominous similarities to the rush to defend fracking as “safe”. Firstly, what often happens is that those making the risk assessment assume that the technologies, their protective measures and their regulatory arrangements will happen as they are supposed to happen. Technologies will perform to the specified standards. People will keep to the rules, the equipment will work as it is supposed to. The gap between theory and real life is not taken into account here. “….real life practices can be far from ideal; and it may be a long time before we realise that this is the case. Sometimes actions are taken that appear to be in defiance of prior experience. The leakage from petrol station storage tanks was underestimated in the US regulatory appraisal of MTBE and so led to an underestimation of the resulting exposures. Although storage tanks can be redesigned to reduce the chance of leakage, this benefit can be lost by incorrect installation. “For PCBs it was assumed that these could be constrained within ‘closed’ operating systems. This proved impossible, resulting in accidents such as Yusho and Yucheng, losses from poorly maintained equipment and even illegal disposal into the human food chain. We should bear in mind here that one of the problems found by PP study is that very often there was a big gap between the regulations and regulatory compliance. For example there was, and has been, a large amount of illegal disposal of PCBs and, in the UK unrealistic assumptions were made about implementation of changes to UK slaughterhouse practices as a crucial part of the response to the BSE crisis. 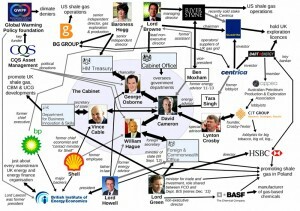 We know from the UK already what happens when a fracking company is trying to cut costs and has friends in high places. The film “The Truth about the Dash for Gas” makes the point that exploratory drilling by Cuadrilla unleashed an earthquake that was 2.3 on the Richter scale. This damaged the bore hole with potentially serious consequences for ground water – yet, despite this Cuadrilla did not tell the Environment Agency for 6 months. When they did they were eventually ticked off by the relevant Minister, Charles Hendry. Is it entirely coincidental that, within a short space of time, Hendry was removed and replaced by a more compliant person? Another incident in the film about fracking in the UK explains how Cuadrilla disposed of “naturally occurring radioactive water” that had come back up the frack well by putting it through a sewerage works that was not equipped to deal with radioactivity. (No sewerage works are equipped to deal with radioactivity). In the case of fracking there is nothing like “regulatory independence” from economic and political special interests” – on the contrary the government has allowed the oil and gas industry to write the regulations and the policy. The role of Lord Browne is particularly central. He is a former CEO of BP, a former non executive director of Goldman Sachs and is currently (Feb 2014) head and major shareholder of the fracking Company Cuadrilla, No one has cast a single vote for this man in an election and yet he has been appointed to the Cabinet Office to advance the fracking agenda. Lord Browne has a long track record of steering British politics from behind the scenes. During the Labour Blair administration BP’s management team under Lord Browne had a close relationship with the Cabinet Office. Thus it was BP who largely designed the European Emissions Trading System and launched it via their influence in London and Brussels. This was based on an experimental carbon trading scheme pioneered by BP. From very early on, it was evident that the BP experimental scheme was ineffectual. The supposed ‘cap’ that it used did not really restrain emissions. Some of the later problems of the EU’s emissions trading scheme were already visible. However, such was the lobbying power of BP and its corporate allies, that their policy was adopted anyway. It has never worked to reduce emissions in any real sense. However, the BP scheme did head off proper control of carbon emissions in Europe and, when carbon prices were high, made windfall profits for the polluting companies. At the time of the Labour Government when Gordon Brown, then Chancellor was asked who was the most powerful person in the country, he did not say Tony Blair, he replied Lord Browne. Under Lord Browne’s management BP was responsible for multiple health and safety catastrophes particularly in the USA. This led to after-the-event regulatory action by the authorities in there including the largest criminal fine ever for air quality violations in history. This was after an explosion at a refinery in a Texas refinery that killed 15 people and injured 170 as well as a catastrophic oil spill in Alaska that killed a worker and injured two others. This unelected Cabinet member has parachuted his appointees into a variety of government ministries. These include 4 appointees in senior positions in DEFRA, the ministry that oversees the regulators (Iain Ferguson, lead non executive Board Member, and Paul Rew, Sir Tony Hawkshead and Catherine Doran – all non executive Board members.) With their help the Environment Agency is being got ready for fracking – for example “streamlining” the procedure to get a permit to dump contaminated water from 6 months to 2 weeks. (As when Cuadrilla’s radioactive water was dumped in the Manchester Ship Canal). Finally Browne put 4 appointees into the Treasury – including Baroness Hogg an independent director of the BG group – whose fracking in Queensland Australia has created public health crisis there. Hogg’s expertise in the management of fracking should be assessed against the fact that when the Queensland government were finally persuaded to look into claims that the BG group’s gas field in Tara were leaking they inspected 58 gas wells in the field and found 26 of the 58 were leaking – in one case above the lower explosion limit of methane and in a further 4 cases close to that limit. 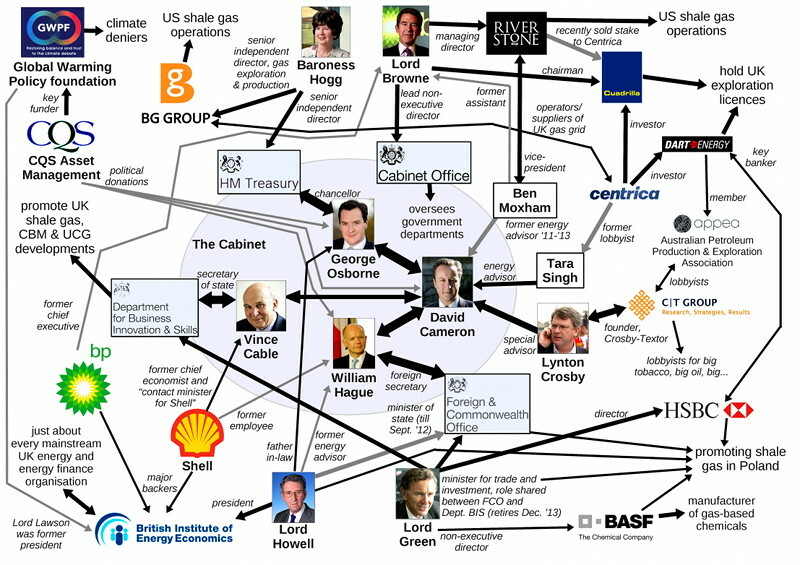 Appointees like Baroness Hogg have been put in the Treasury to ensure that fracking is given generous financial support. Sure enough a package of financial support aimed at stimulating the shale gas industry was unveiled in the 2013 budget. This included a new shale gas “pad” allowance, ring fenced for up to 10 years thus halving the tax the Shale gas industry will have to pay. In addition shale gas producers will be able to offset their exploration and development costs against tax for a decade. The budget report also stated that the government will consult on whether these measures should also apply to other forms of onshore unconventional gas including coal bed methane and the highly controversial underground coal gasification. Further the budget also “committed the government to develop proposals to ensure that local communities will benefit from shale gas projects in their area”. We now know that this means financial measures to incentivise cash- strapped local authorities to accept gas fracking in their areas – contrary to their responsibilities to look after the interests of local communities. The “Regulatory independence” advocated as a key lesson of the PP Report therefore looks like a completely lost cause as far as the UK is concerned. What is happening in government is consistent within a long and shameful history of British public authorities betraying their responsibility to look after the health and safety of the general public because the regulatory process has been captured by business interests. Image created by Paul Mobbs. Click to enlarge. The Prime Minister claims that “The regulatory system in this country is one of the most stringent in the world. If any shale gas were to pose a risk of pollution, then we have all the powers we need to close it down”. At the same time the Environmental Agency (EA) has been allowing drillers to “mark their own homework” – effectively to self-certify their own compliance with the regulations. A report in Private Eye gives a real life view of how tightly Cuadrilla is being regulated and cites the way that they have handled ‘produced water’ from fracking that is radioactive because of contamination by the rocks underground. Naturally occurring radioactive materials are common in the oil and gas industry. The Private Eye article showed how Cuadrilla had hired specialist firms to provide supervise radiation protection and deal with radioactive waste. One of these firms had no previous knowledge of dealing with radioactive waste until approached by Cuadrilla and yet was able to be used as a reference that Cuadrilla’s plans for dealing with radioactive waste were ‘optimal’. The other company gives just one day training courses for Cuardrilla’s employees to turn them into ‘radiation protection supervisors’. When Cuadrilla produced excessive radioactive water the Environment Agency allowed them to dump it . As Mike Hill, an oil and gas engineer who supports fracking but only with adequate regulation has pointed out, the Office of Unconventional Gas and Oil is at one and the same time cheerleader for the unconventional gas industry and its regulator. A more appalling example of how not to regulate an industry could hardly have been constructed. It is not surprising then that what regulations exist are modelled on the offshore industry where countryside and a residential community do not exist. The Environment Agency never visited the Cuadrilla wells at all to ensure that the wells were constructed as agreed. Nor does the EA inspect the chemicals used to verify what they are and in what quantity. Nor is the flow back verified. concerns workplace awareness of emerging patterns of ill health. The histories of usage of asbestos and PCBs provide examples where workers were aware of what regulators subsequently recognised to be a serious problem. Similarly, local communities may become aware of unusual concentrations of ill health before the authorities, such as the Love Canal example cited in the Great Lakes case study. It has been communities in the USA and Australia who have raised issues about their health and well being and what actually happens in a fracked gas field – but what happens to these people who do resist what is happening and try to draw attention to the dangers? The PP Study is once again revealing – it shows that there has been a repeated tendency of politicians and the vested interests who have bought their support to try to “shoot the messenger” bringing bad news, to shut them up and to try to force self censorship. This is again matched with the gas fracking experience. For example in the USA people whose lives have been ruined by the gas fracking industry find that they can get financial compensation, help with their medical bills and assistance with obtaining clean water – but the price for doing so is agreeing to be bound by gagging orders – even imposed on their children for the rest of their lives. “Two young children in Pennsylvania were banned from talking about fracking for the rest of their lives under a gag order imposed under a settlement reached by their parents with a leading oil and gas company. The settlement, reached in 2011 but unsealed only last week, barred the Hallowichs’ son and daughter, who were then aged 10 and seven, from ever discussing fracking or the Marcellus Shale, a leading producer in America’s shale gas boom. “The law compels natural gas companies to give inquiring healthcare professionals information about the chemicals used in their drilling and production processes — but only after the doctors or nurses sign a confidentiality agreement. In the UK we already have indications that doctors and public health professionals will be leaned on to prevent them speaking out, as is their professional and ethical responsibility. Or if they do speak out they are ignored in favour of a more compliant “expert opinion”. This can be seen by the way that Public Health England have produced a report which is being used by government in their propaganda offensive to declare fracking safe. “The review from PHE states that fracking to extract shale gas is unlikely to have a detrimental effect on the health of people living nearby, provided that operations are properly run and regulated. However, the body has admitted that little robust research has looked specifically at the health implications of fracking and that most of the existing data come from the United States, which has a different geology and may use different chemicals and procedures to the ones that could be used in the United Kingdom. Furthermore, the review makes clear that it focuses solely on the potential effects on health of the chemicals used and any radioactive material released. Crucially, the report excludes considerations which are key to any public health assessment, including occupational health and safety, climate change and greenhouse gas emissions and the quality and availability of water resources. The review also fails to mention the risks of workers at shale gas extraction sites inhaling crystalline silica, which is known to increase the risk of lung disease. Also excluded from the review is an assessment of the risks of other methods of unconventional hydrocarbon extraction, such as coal bed methane extraction. “The only other thing I’d add is that the PHE report says on the front, “draft for comment”. How therefore can they make a definitive judgement BEFORE the consultation period has begun? None of the mainstream media picked up on the “draft” issues. What’s more, the PHE document does not conform to a standard health impact accessment because they’ve failed to quantify both the scale of the source, the likely vectors for transmission, and the exposed receptor populations. More interestingly, the ‘addendum’ at the end of the report notes, “PHE invites submission of additional relevant articles from the scientific literature for consideration if these have not been considered in the report or identified below.” It then lists just about every relevant paper on fracking impacts — i.e., they not only have failed to explain their reasons for excluding the findings of a wide-range of peer reviewed research from their report, they also are specifically excluding anyone else from citing these studies in response on the basis that they’ve already dismissed them a priori. The de-regulation agenda matches the governments programme of financial and staffing cuts. Owen Paterson’s Department for Environment, Food and Rural Affairs was hit by cuts of ten per cent in 2010 with further drastic cuts in the spending review for the period to 2015/16. This led political analysists to see “an uncertain future for Britain’s fracking watchdog”. It is no surprise then to read in the study of the PP how Britain delayed action on acid rain caused by sulphur emissions from coal fired power stations in the UK because the impact was perceived as being mainly abroad. It affected other people so it was politically possible to ignore and deny. In an ideal world that really took the precautionary principle seriously inter-disciplinary perspectives on potential environmental and health risks would be fostered and information being raised from sources like this would be taken seriously and looked into further. However the experience written up in the Precautionary Principle study shows that particular professions, with particular perspectives and concerns dominate the risk assessment process. In the case of fracking geologists have carved themselves out a particularly prominent role. The British Geological Survey is constantly being mentioned in relation to fracking – both as a source of information about what the potential shale gas resources are, and also in regard to risk mitigation. It too takes a large part of its funding from the oil and gas industry and it is not without significance that about one half of geologists go to work in the oil and gas sector. Although there will doubtless be people at organisations like the BGS who are aware of their ethical responsibilities it is also difficult to see the BGS as “fully independent”. It is important to note here that the BGS have created their own specialist department for these issues and are profiling themselves as experts on the safety of fracking. A key theme that they have ended up studying is seismic activity as a result of fracking – particularly as they were asked to help investigate a small earthquake as a result of Cuadrilla’s activity in Preece Hall in Lancashire. The BGS were instrumental in recommending a so called “traffic light” system in which drilling is halted for further investigations if seismic activity is detected above a particular magnitude. Cuadrilla recommended 1.7 as being that magnitude with an additional 0.9 magnitude post even rise for operational purposes if it appears safe to continue. However the BGS argued that 0.5 would be a more acceptable level. So far so good for the BGS….but they BGS then argued that this 0.5 could be adjusted up to a magnitude of 3.0 maximum later if conditions appear to justify this. This has led communities members at Preece Hall to point out that the 0.5 appears to be a magnitude designed to appease community concerns at first. Later, when the industry has sunk a lot of capital into different landscapes, when there are hundreds of wells with thousands of fracks occurring, the commercial pressure to turn a blind eye will be very powerful. The likely tendency then will be to allow the acceptable level seismicity with its associated level of well damage and contamination to be screwed upwards will be very powerful. According to David Cameron if it appears that a fracking company is putting people’s health at risk the regulators have powers to close things down. However, as we have already seen, what happens in the real world is rather different. When well connected people with friends in government, in the media and among regulators, have sunk huge amounts of their own money, and bank money, into business ventures, there is an extremely powerful pressure to make that money pay. The whole history of regulating industry shows an extreme reluctance to close down processes which would impose big losses on business – especially when the people being hurt are just “little people”, without the same level of connections and friends. That’s why the BGS idea that the level of acceptable seismicity may be allowed to rise later is so dangerous for ordinary people (and convenient for the industry). Another issue that the BGS have taken up is water contamination. One of the things that they are doing is gathering evidence prior to any fracking. The rationale is that baseline figures for water quality before fracking are necessary in order to prove whether or not fracking subsequently gives rise to contamination. This seems like a thoroughly good idea until you wake up to the fact that if the BGS do discover contamination after fracking then it will be too late to do anything about it at the location concerned. In other words the BGS is not advocating the precautionary principle be applied – for this would be an argument not to frack in the first place because of the danger of a negative impact and the consequences of that impact. In their own presentation of the risks the BGS are focusing on how deeply the fracking occurs and what separates the shale or layer to be fracked from aquifers above. Repeatedly we hear their argument that fracking is often a mile underground and therefore, it is argued, a long way below a level at which contamination can occur. This way of presenting the problems focuses where the industry appears to have the stronger arguments. I write “appears” because a peer reviewed study by Duke University academics has shown that fracked groundwater systems in the US pose risks to other groundwater systems that were thought to be, but were not, hydraulically separate. This study clearly shows the risks in some groundwater geologies of cross contamination. Moreover, in focusing on the distance between layers to be fracked and aquifers other issues of potential contamination get neglected – issues which involve engineering failure and risks of leakage back into the water table and soils at the surface. Fractures in well casing and cement seals, perhaps caused by seismic activity, perhaps caused by inadequate cement curing are common in the industry. They can occur at any level causing contamination effects. Further to this – fracking involves a very a large volume of produced flowback water at the surface. This has to be stored and treated and a lot can go wrong at this stage too – particularly if, as is often the case, companies are under intense pressure to cut costs and cut corners. These other kind of issues ought to be picked up by other types of professions like water engineers – but these other professions have to be prepared to take up the dangers. In fact there is already intense pressure being exercised to “manage” potential difficulty from other professional groups and institutions – for example, water management and environmental management professional groups. Is the water industry compromised too? “Severn Trent Water Ltd pleaded guilty, on 20 January 2014 at Coventry Magistrate’s Court, to eleven counts of supplying water unfit for human consumption. The case related to the supply of water with an objectionable appearance to consumers in Broadway, Worcestershire. The charges were brought under Section 70 of the Water Industry Act 1991 (as amended). ”The Company was fined £6,000 on each of eleven counts totalling £66,000 and paid £25,950 towards prosecution costs and a £120 victim surcharge. In response, Professor Jeni Colbourne, Chief Inspector of Drinking Water, said: “The Inspectorate brought this case because the company didn’t listen to consumers and put their health at risk as a consequence of systemic failings in its approach to safeguarding tap water quality. The profits of Seven Trent Water at the last annual report were £265.5 million so paying a fine of this magnitude will not be onerous. Prosecuting and fining corporations is not like prosecuting and fining people. No one goes to jail and companies are not closed down – although in principle they ought to be when corporate misbehaviour justifies such action. People working in industries where the profit and loss account is what matters may be held hostage by the ethical level of the industry. It may be that to whistle blow or to tell the truth is to risk losing one’s job. This fear gives rise to powerful collective psychological pressure and a collective psychological state called “consensus trance”. According to psychologist Charles Tart groups agree on which of their perceptions should be admitted to awareness (hence, consensus), then they train each other to see the world in that way and only in that way (hence trance). The emperor without any clothes is an example of this idea. It is the Chartered Institution of Water and Environmental Management that profiles itself as an ethical guardian for the water industry. It is a registered charity and is another “royal” organisation as the charter in question is from the monarch. They have produced a document called “Shale Gas and Water” which was compiled after consultations and a conference. It is a very detailed document and there is a lot that is valuable in it. However, it still raises fundamental issues of professional ethics. It looks as if the “Chartered Institution” has fallen in line with the “consensus trance” that the emperor is wearing some clothes and that regulation can keep us all safe. “There has been widespread public concern over well failure with an industry report estimating that by the time a gas well is 15 years old there is a 50 per cent chance of failure, and two out of four of Cuadrilla’s wells in Lancashire have failed. These are alarming statistics, however in spite of any drilling-related difficulties; the term failure does not necessarily mean any indication of leakage of contaminants to the environment, and this was not the case in Lancashire. Weasel words – Cuadrilla did not report the failure for many months and were rebuked for not doing so – and the minister who rebuked them was later sacked. The chief problem with any barrier system is that there is always a contact with the rock strata, no matter how many barriers there are – and that point of contact with the strata is cement. If and when the cement fails to make a bond with the rock there is a fissure which can widen for a variety of reasons and then eventually migrate upwards. That can happen for several reasons – including seismic activity, perhaps induced by the fracking itself, as happened in this case. A peer reviewed study from Duke University in the USA found “In aquifers overlying the Marcellus and Utica shale formations of northeastern Pennsylvania and upstate New York, we document systematic evidence for methane contamination of drinking water associated with shale gas extraction”. A further peer reviewed study found the following: “We analyzed 141 drinking water wells across the Appalachian Plateaus physiographic province of north eastern Pennsylvania, examining natural gas concentrations and isotopic signatures with proximity to shale gas wells……Overall, our data suggest that some homeowners living <1 km from gas wells have drinking water contaminated with stray gases” (i.e. methane, ethane and propane). The following statistics of on shore gas well failure are from Pennsylvania in the USA. Of the 1,609 wells drilled in 2010 a total of 111 were failures = 6.9% failure rate. Of the 1,979 wells drilled in 2011 a total of 142 were failures = 7.2% rate of failure. Of the 1346 wells drilled in 2012 a total of 120 were failures = 8.9% of failure. These figures are consistent with industry data and are clearly not improving even though the industry is regulated – the figures come from the regulators! The figures are from the department of environmental protection in Pennsylvania quoted in a paper by Professor Anthony Ingraffea . Independent examiners – the rating agencies of the oil and gas sector???
. “Independent examiners” would come up through the industry. Their peer group would be those they are regulating. One has to ask therefore if they would be anything like the independent examiners of the finance industry who gave AAA ratings for what industry insiders for financial products were calling “toxic trash” and whose rating could be bought by payments from the issuers of that toxic trash? There is plenty more involved in fracking than what happens underground. According to Mike Hill, regulation is needed for flaring and traffic too. He makes the point that the amount of tanker trips to take flow back water from a standard traffic pad would amount to 3,384 standard trips and that with 120 pads and 3,000 wells (proposed in PEDL 165 in the area between Preston and Blackpool, this would involve over 400,000 initial tanker trips. There comes a point however where one has to ask if the amount of regulation, the energy costs, the disruption and the amount of risk justifies the energy yield – also bearing in mind the climate implications. Continuing down a hydrocarbons route means that the harms exceed the benefits and this whole charade is only possible by ignoring harms – because the carbon money lobby is so powerful in government. It has to be admitted however that if fracking was banned, with the North Sea fields in decline, there would be no future for many currently employed in the oil and gas industry – nor for many employed in ancillary departments of government and a very large number of people in professions like geology. This, I fear, is a large part of the current problem. In recent years psychologists and business studies academics have called attention to what is called “optimism bias”. People take decisions from what they know, and routinely fail to take into account that there is always more out there in the world to be sorted out, to cost money, to delay completion and to go wrong. There is also always more out there in the world to cause accidents, spills and disasters – but the government doesn’t want to acknowledge that. That was why the precautionary principle was formulated – however the precautionary principle is a personal insult to brave innovators, and it threatens the already committed investment of time and money of heroic entrepreneurs and venture capitalists with friends in high places. Digging in for a long fight? The failure to take major health and environmental risks seriously occurs repeatedly in regulatory institutions and has so done for over a century. There are repeated cases where the precautionary principle fails because industry vested interests prevails so that politicians, regulatory agencies and professional bodies fail to do their job of protecting the public. The signs in regard to fracking are highly alarming because many of the same issues appear to be re-occuring in this case. Perhaps most worrying of all is that the PP study shows that when governments and regulators dig in and refuse to back down the situation can become even worse, because their credibility is at stake. Governments and regulatory agencies do not like to do U turns because it makes them look fallible, incompetent or even corrupt – and unfortunately a whole series of institutions and major political interests have put their reputations on the line by falling in with the wishes of the fossil fuel industry – the Royal Society, Royal Academy of Engineering, Public Health England, the Environment Agency, the Health and Safety Executive and the British Geological Survey. The implications are frightening but they have to be drawn. We are probably in for a long struggle. What kind of environmental regulation? Environmental “resources” like water and the air are shared. For example, the water system is a common pool resource that ought to be managed in the interests of everyone AND taking into account ecological system realities. The ‘interests of everyone’ means – people for residential purposes (drinking, cooking, washing etc), different industries (brewing, agriculture, leisure sailing, angling etc). Taking into account ecological system realities means that the needs of wildlife, plants, drainage, rivers and streams, hydro-geological functions etc also need to be taken into account. There are a variety of users for water, a variety of uses and a variety of ecological realities all of which must be harmonised. Rational organisation would be to achieve that. The frackers and government want to use brutal economic and political power to allow ONE business group – the oil and gas industry – to override and put all other users and uses for water in jeopardy. They want to go to the head of a queue for their dangerous and toxic use of water which puts into question the long run abilities of communities living in ecological systems to continue to function. The answer is to counter-pose the establishment of a water commons to be managed by informed negotiations between all water users of appropriate uses for water at a local and regional level. That is, I believe, what we need to construct as we get to know what uses and users for water that there are and come together across water sheds to organise the defence of our shared resources against poisonous extraction by private industry . Corporate European Observatory and PLATFORM. (2009). Putting the Fox in Charge of the Henhouse: How BP’s Emissions Trading Scheme was sold to the EU. Edited April 9 to make a correction: Lord Browne was appointed to the Cbinet Office rather than the Cabinet. This is an unprecedentedly good article. It identifies and tries to deal with the elephant in the room. We in ‘to-be-fracked’ New Brunswick, Canada owe you a debt of gratitude. Thank you Brian Davey for this magnificent piece of writing. The article is fabulous. I must also thank you from the bottom of my heart for proper references! You’ve saved me hours if not days of trawling the web. Thanks to you. I’m researching fracking and political power and this is by far one of the best online articles I’ve read on the subject. Hats off to you Sir. No amount of science or robustness of a regulatory regime can prove fracking is safe or ensure the level of safety now or in the future. NOBODY can predict that human error or machine and equipment failure will not occur. But history tells us that the hydrocarbon extraction industry experiences human error and equipment failure on a daily basis resulting in serious injuries and fatalities along with catastrophic environmental damages. In light of this knowledge, and the fact that fracking gone wrong can cause irreversible damage to, aquifers, soil, air quality and the climate, that affect the majority, the long-term impacts that surround the shale and coal bed methane extraction industries outweigh, * BY FAR*, the short term economic advantages to be gained by a select few. Neither can anybody predict whether natural events such as earthquakes, ground movements or build up in formation pressures will or will not occur during drilling, production or long after plug and abandonment that can impact on the integrity of a well.